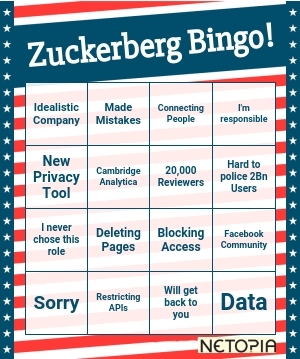 Zuckerberg Bingo – Print out and Play! We have been here before with Facebook, the company has a long history of apologising. Firstly when Zuckerberg was suspended from Harvard forun-authorised use of college photographs. Harvard accused him of: “breaching security, violating copyrights and violating individual privacy“. He apologised. Mark Zuckerberg is to appear before congresss to answer questions regarding Facebook’s data leak to Cambridge Analytica. Fast forward four-years to 2007. Facebook is enduring global success, and the company introduced a tracker of sorts,entitled to them, and generally impinge on user privacy. Unsurprisingly there was a backlash and Zuckerberg apologized. In 2010 there were promises and apologies from Zuckerberg, most famously via an op-ed in The Washington Post. And as if nothing had been learned, Facebook signed a consent decree with the Federal Trade Commission in 2011 which committed the company to better user privacy.